Life in the Boomer Lane has just returned from visiting Beloved Daughter in London. BD, her husband, and their one year old live in an utterly charming late 1800s second floor flat in Marylebone, a gorgeous neighborhood on the edge of Regent’s Park, filled with trendy shops, fabulous restaurants, and a certain number of Americans who frequent trendy shops and fabulous restaurants. Her flat is called a two bedroom. In this case, the definition of bedroom is “a room with a ceiling, floor, window and door.” There is no requirement that the room be big enough for an actual bed, and there is no closet. The entire flat has one closet, which is located in the foyer. The need to accommodate small spaces means that the refrigerator is mini-sized and the washer/dryer is exactly that: one unit that both washes and dries. In a clever coup of technological engineering, the inventors of this device have created something that sort of washes and sort of dries, depending on one’s definition of “sort of.” Most often, wet clothes have to be draped over chairs and couches and shower doors and baby gates. The interior of the washer/dryer is small, meaning that few clothes can be washed or dried at any one time. For that matter, it is almost always running, almost always in process of sort of washing or sort of drying. And, because it is located in the one large room that houses the kitchen, living room and dining area, one can almost always hear the melodic sounds of clothes being sort of washed or sort of dried. But there are perks. The ceilings are crazy high and the windows are crazy huge. Better still, one of the living room windows is actually a French door, opening onto the tiny street-facing balcony. Beloved Son-in-Law has managed to fit a gas grill onto the balcony. It’s the only grill along the entire street and when he is out there cooking fish or ribs, he provides a real curiosity for the Brits who are walking by. And the location can’t be beat. 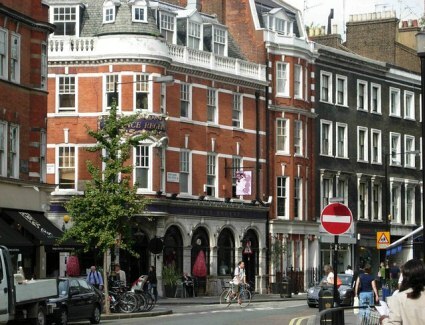 Two blocks in one direction is either the tube (subway) or Regent’s Park, two blocks in another is the Marylebone High Street shopping area that stretches on for blocks and blocks. Even the British Museum and Hyde Park are within walking distance. It’s a fantasy version of an urban lifestyle. A combo washer/dryer seems a small price to pay. I’d love to live here, it’s such a nice area! I often walk past letting agents in Marylebone, peer in and hope for the perfect property to appear 🙂 In my experience though anything remotely practical is way out of my price range so I think it’s going to be purely window shopping for the forseeable future! Your daughters flat sounds lovely though, I enjoyed reading this post! Thanks. My daughter and her family just moved back to the States last week. I will deeply miss my many trips to London.